In the Orthodox Church, the feast day of St Thomas, the faithful disciple of the risen Lord, also known as ‘the Twin’ (Didymus) is celebrated precisely one week after Easter – that is, on the Sunday following Pascha, which is known both as the ‘Sunday of Thomas’ and the ‘After-feast of Pascha’ (Antipascha). Even though popular piety has wrongly attributed to him names such as the ‘doubting’ or ‘faithless’ Thomas because of his alleged suspicions concerning the resurrection of Jesus, his place in the Liturgical cycle of feasts affirms a radically different theological vision of St Thomas the apostle full of faith. Indeed, a correct exegetical examination of the Gospel passage which is heard on the ‘Sunday of Thomas’ (Jn 20:19-31) will confirm Thomas’ profound depth of faith, expressed, as we shall see, in his confession in the divinity of the risen Jesus. It has to be admitted that St Thomas’ ecstatic declaration of faith in Jesus Christ in terms of ‘My Lord and my God’ (Jn 20:28) is one of the most profound pronouncement of the deity of Jesus in the entire corpus of the New Testament since it not only attributes to Christ the highest Christological title in terms of His divinity [Jesus Christ is referred to as ‘God’] but also demonstrates the unconditional acceptance of Thomas in the risen Lord [this is seen in the use of ‘my’ God – the predicate of dedication]. In this way, far from being a story ostensibly about the lack of faith on the part of this apostle, the fourth Gospel writer presented St Thomas as a man who desired nothing less than a personal and palpable encounter with the risen Lord. And the reason why St Thomas wanted nothing less than an immediate encounter with the risen Lord was so that he could see for himself the continuity with the Jesus that he had known during His earthly life before His crucifixion – as opposed to One who had mysteriously risen and left the disciples orphaned. Therefore, throughout the episode involving the apostle Thomas what is revealed is nothing other than the apostle’s insatiable hunger and desire to encounter Jesus Christ. However, before looking specifically at several aspects of the passage in John 20:19-31, which depicts Thomas’ encounter with the risen Lord, a few brief remarks from other passages in the New Testament, where St Thomas is mentioned, will show Thomas’ fidelity and trust in Jesus Christ even before His resurrection. The fidelity and courageous character of St Thomas is seen in other episodes in the Gospel of St John. Two such examples are the following: firstly, upon hearing that Lazarus had ‘fallen asleep’, Jesus told the disciples that He would return to Judea to bring Lazarus back to life. Whilst the Gospel of St John records the disciples alerting Jesus of the dangers of the journey, since the Jews were trying to stone Jesus, the Evangelist notes the apostle Thomas as unhesitatingly stating: “let us also go, that we may die with him” (Jn 11:16). Surely such a spontaneously spirited and bold response by Thomas, expressing his willingness even to die together with Jesus is totally incompatible with a person characterized by doubt, hesitation and scepticism. A second episode in which the spiritual insight and unwavering faith of Thomas in Jesus is verified is when the resurrected Lord appeared to seven of his disciples after His resurrection – Thomas being one of them. When Jesus showed Himself to these seven apostles by the Sea of Tiberias and told them to cast their nets on the right side of the boat (cf Jn 21:6), since they had caught nothing all night, the Gospel records that they obeyed Jesus immediately. Again such a response by St Thomas (together with the other disciples) would have nothing to do with a person who had doubted or lacked faith in Jesus. These two episodes, together with Thomas’ encounter with the risen Lord eight days after the Resurrection, will demonstrate without doubt Thomas’ profound depth of faith in Jesus Christ. And it is to this that we now turn. This Gospel passage in Jn 20:19-31 beautifully relates the faith experience of the apostle Thomas. Upon setting the scene (it was evening and all the disciples were gathered together in one room for fear of the Jews), the Gospel writer proceeds to describe Thomas with some precision: we read that he was called the ‘Twin’, that he was one of the twelve and that he was absent when the risen Jesus had formerly appeared to the disciples bringing His peace. The pericope continues to depict the appearance of the Lord eight day later, this time to all the disciples including Thomas. And after stating that Jesus had appeared amongst them, the Evangelist records how Jesus invited Thomas to touch His nail prints and put his fingers into them. With such a strong attestation, the Gospel writer does not tell the reader whether Thomas accepted Jesus’ invitation but simply recounts Thomas’ spontaneous and heartfelt outburst expressing his faith in the divinity of the risen Lord. What follows is Jesus’ universal blessing of believing without seeing, together with the conclusion of the Gospel which conveys the purpose of the entire book – that is, to lead all subsequent readers into their own personal and deepened experience of faith in the risen Lord. and 31 of chapter 20 which form the conclusion of the Gospel before the Epilogue, the entire chapter deals with events which had taken place on Easter Sunday both in the morning and evening in Jerusalem, together with the appearance of the risen Jesus to Thomas eight days later. Its place within the ‘Book of Glory’ tells the reader immediately that the Thomas story is not concerned with highlighting Thomas’ doubt but rather showing the splendour and revelation of Jesus as God. The Thomas story (verses 24-29) occurs immediately after the appearance of Jesus to Mary Magdalene (verses 11-18). It is precisely within this context that the reader would know that the Evangelist would have wanted to show that, just as Jesus had led Mary Magdalene on her journey to faith, so too would He now lead Thomas to an unconditional faith. That is to say that, just as Mary Magdalene and the Myrrh-bearing women in general were the first witnesses to the empty tomb and announced its meaning to the disciples, so too would Thomas bring the Christian faith in the resurrection to its climax becoming in this way a bridge for future believers. Even from this brief yet succinct literary analysis, one can see that the Thomas narrative, which is intertwined with dialogue is part of the Evangelist’s central purpose: namely to record the appearance of the risen Lord to an increasing number of people and to lead them to a faith which is not dependent upon seeing. That is to say, the Evangelist wanted to emphasize that just as St Thomas was an apostle who embraced the risen Christ, so too were subsequent communities to do the same, since faith in the Lord was not purely dependent upon ‘seeing’. Indeed, unlike the other Gospel writers, St John the Evangelist wanted to emphasize, in quite some detail, the reaction of the apostles – particularly St Thomas – at the news that Christ had risen. In the case of Thomas the apostle, we discover that he wanted nothing less than to meet the risen Lord for himself. Indeed, this desire by Thomas to meet the Lord personally and not simply depend on somebody else’s account is heightened by the Gospel writer in his description of the continued insistence of the disciples to convince Thomas of the Resurrection. In verse 25 we read: “So the other disciples told him, “We have seen the Lord.” But he said to them, “Unless I see the mark of the nails in his hands, and put my finger in the mark of the nails and my hand in his side, I will not believe” (Jn 20:25). One can only imagine why the disciples continuously insisted in relating their encounter of the risen Jesus to Thomas. Most probably the reason lies in that Thomas would have unremittingly discarded their account, wanting instead to have his own personal meeting with the risen Lord. To be sure, eight days had to pass before Thomas would meet Jesus for himself. And in that time we learn that Thomas had been continuously subjected to the insistence of his fellow disciples’ testimony to having seen the Lord. It is the imperfect tense of the verb ‘told’ in Greek which indicates a continuous action on the part of the disciples to convince Thomas. This repeated ‘telling’ however resulted in nothing since Thomas had to experience the personal presence of Jesus for himself. And it happened, eight days later, when the disciples were assembled in the house again, Jesus is depicted appearing to them all, including Thomas this time. Following his ultimate self-surrender, which came about as a response to God’s act of gratuitous self-disclosure, Thomas was led to proclaim ecstatically his unreserved acceptance in the risen Lord with the following confession: “My Lord and my God!” (Jn 20:28). This constitutes the most climactic moment in the entire narrative since it discerns the true identity of Jesus as Theanthropos (the God-man) and therefore the completion of Thomas’ journey of faith. In proclaiming the risen Lord in terms of ‘Lord’ and ‘God’, St Thomas discerned Christ as the glorified Son of God in the Father’s eternal kingdom to which all Christians look forward with eager expectation. In this way, far from simply being an utterance which acknowledged the presence of the risen Lord, Thomas’ confession expressed the very identity of Jesus as ‘one with His Father’ (Jn 10:30). In this proclamation we see the verification of what the opening words of the Gospel had announced, namely that “in the beginning was the Word, and the Word was with God, and the Word was God” (Jn 1:1). The apostle Thomas was able to discern that the one who had become a human person and dwelt on earth was the one “full of grace and truth” (Jn 1:14). Upon recognizing Jesus to be ‘God’, Thomas was able to dedicate himself entirely to Him. His total commitment to the risen Lord is betrayed in the predicate ‘my’ which leaves no doubt as to the extent of Thomas’ own personal faith. Indeed the ‘my’ is of vital importance as it betrays not only Thomas’ unwavering faith but also his untiring commitment to the Lord. On this issue, a modern commentator of the Gospel of St John, wrote: “my Lord and my God… confesses to the risen Jesus that he [Thomas] belongs to him as his willing subject; he adores him and henceforth will serve him as he deserves”. In this way, Thomas had fulfilled the words of Jesus who had invited all his followers to honour Him as they honour God: “so that all may honour the Son just as they honour the Father” (Jn 5:23). That Thomas had taken a most profound leap of faith is shown clearly in the fact that up to that point nobody had made such a proclamation of faith in Jesus Christ. The one who was crucified but now alive would be worshipped in precisely the same manner as God the Father. At the end of this brief study the authentic personality of St Thomas has become clear. Far from being a disbeliever, St Thomas was the apostle responsible for offering all future Christians a most exalted portrait of Jesus Christ as ‘Lord’ and ‘God’. Indeed it was St Thomas who was able to uncover the deepest identity of Jesus Christ, thereby affirming Jesus to be the very revelation of the life-giving mystery of God. In this way, he was able express most succinctly, in his confession of faith, the intention of the entire Gospel: namely that all have been called to believe that Jesus is not only the Messiah and the Son of God but also ‘God’, divine with exactly the same divinity as God the Father. And in being divine, Jesus Christ continues to be the one who gives life to all those who believe in Him, and together with the Holy Spirit, who leads all to the Father. Thomas is also known as ‘the twin’ because his name comes from Aramaic meaning twin, for which the Gospel of John gave the Greek equivalent Didymus. However the Gospels do not tell us who Thomas’ twin was. It is said that after the Resurrection, Thomas went to India to preach the Christian message. 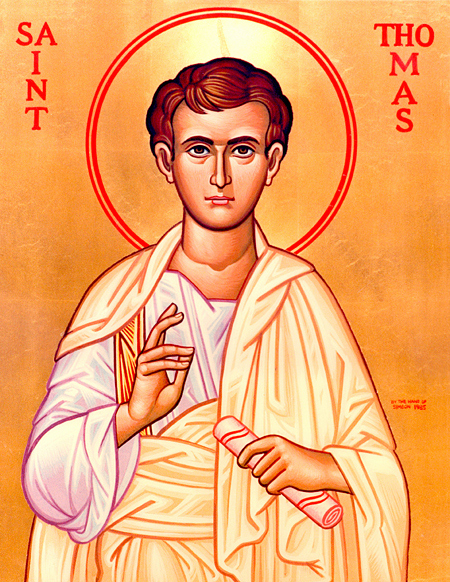 Today the Oriental Orthodox Church of St Thomas in India claims St Thomas to have been its founding apostle. In a deeply insightful article on the person and faith of St Thomas, Archbishop Stylianos of Australia rightly argued that since Pascha is the climax of the entire ecclesiastical year, then one would have expected the Sunday immediately following Easter to be considered a most significant feast, indeed more important than the remaining Sundays of the Liturgical year. (‘St Thomas and the Truth’, Voice of Orthodoxy 11.5(1990): 41). Indeed, I am gratefully indebted to many of the thoughts expressed in this article regarding the faithfulness of the apostle Thomas. The Gospel according to St John is conventionally divided into five sections by Biblical schools: 1) The Prologue (Jn 1:1-18); 2) The Book of Signs (Jn 1:19-12:50) -there are seven signs: a) Jesus changing water into wine; b) the healing of the nobleman’s son; c) the healing of the lame man; d) the feeding of the multitude; e) the walking on water; f) the healing of the man born blind; g) the raising of Lazarus; 3) The Book of Glory (Jn 13:1-20:31); 4) The Conclusion of the Gospel (Jn 20:30-31); 5) The Epilogue (Jn 21:1-25). Archbishop Stylianos of Australia, St Thomas and the Truth, 43. Incidentally Thomas’ personal confession of faith is similar to that of Mary Magdalene: “They have taken away my Lord” (Jn 20:13). Both use the predicate ‘my’ which show the person to whom they are totally dedicated. George R. Beasley-Murray, John, 386.